OTTAWA - Forget the fact that the fall session of Parliament has been put off for a month: the federal Opposition is trying to hold the Conservative government's feet to the fire by holding a virtual daily question period. On Monday, the New Democrats kicked off their challenge to Prime Minister Stephen Harper and his cabinet members to answer questions posed through social media. Not surprisingly, the Senate scandal — in particular, the $90,000 cheque former Harper chief of staff Nigel Wright gave to Mike Duffy to cover the senator's dubious expense claims — figured prominently. "On June 5th, @pmharper told the House no one in his office other than Nigel Wright knew about the $90K," NDP Leader Tom Mulcair wrote on Twitter. "Does the PM stand by this?" There was no response from Harper or the Prime Minister's Office to the tweet. 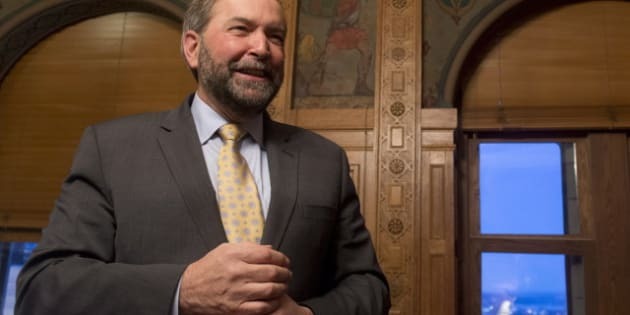 Prorogation of Parliament will stall debate over changes to employment insurance, halt the work of a committee on missing and murdered aboriginal women and delay efforts to improve rail safety, Mulcair said at the campaign launch. The Harper Conservatives have closed down the Commons, saying they'll launch a new parliamentary session with a throne speech Oct. 16, just after Thanksgiving. The opposition parties have complained that Harper is merely trying to evade questions, particularly over the Senate expense scandal. Asking questions via Twitter, however, has its drawbacks. Unlike in the House of Commons, where Harper or one of his colleagues is compelled to provide some sort of reply, the Twitterverse allows anyone to answer the question. Some of Monday's responses to Mulcair's question attacked the prime minister for failing to be forthright. But others lobbed questions back at Mulcair. One person tweeted, "Can we prorogue your beard?" while another asked whether Mulcair would renounce his French citizenship.